I'm really baffled as to why both FATE and my SPEC SPIDEY run haven't been collected, in an age where almost everything is being collected. The time has surely come! I have Kirk's Fate Bind. Let's see what we can do with this petition this go round. I believe your run is a combination of Gerry Conway setting you up prior to your involvement with Spec, then you just ran it home so to speak. I reached out to Conway as well. I'm sure Marvel will get around to this sooner or later...but sooner is always better! I am always getting into "fights" online with people saying Sal was a hack and not as great as many artist of his time (of course comparing him to John which is a REALLY tough act to follow). I think he did more than just stellaer art on a lot of titles/projects, including this one with you. I hope we get to see this collection no later than 2018. To me, people who call Sal a hack are like people who think Ringo Starr was a bad drummer who got lucky: They just don't get it. Sal is a master illustrator and storyteller who brings depth and passion and clarity to the stories. A hugely underrated artist. One of Marvel's all-time best. One of my favorite things about Sal is the sense of emotional and physical authenticity in his work. When his characters get angry, their expressions are truly frightening. When their heart breaks, yours breaks with them. And Sal is one of the only artists in comicdom who makes a punch look like it actually HURTS, and it isn't just another day at the office. That's just one reason why I think he was the PERFECT collaborator to bring the Harry Osborn saga to life. A resounding "YES!" to all that, David. Add to that the fact that Sal was, and remains, an impeccable storyteller—everything crystal clear, flowing effortlessly from panel to panel—and you've got (as I said earlier on this page) one of Marvel's all-time greatest artists. Can I way in on Sal Buscema? First, I love his art. It was great on its own, but as far as Spec. Spider, it was very much right place right time. His art so perfectly evokes the first 7 years of cities in the 90s (most cities, but specifically NYC for Spidey), where it was slowly starting to turn away from the crime and change the image, but still very much a still mired in it. Cleaning up, but very much still gritty. Good no matter what though. All that love having been said, and I do think that Hack is categorically wrong, but I do understand not liking the art. He had a very unique style, and while I believe that in comics personality is more important that refined skill, that personality is often divisive. It stirs up strong emotions, both good and bad. Interestingly, on Friday I bought some Spider-man comics from the 70s, one of which had art by Sal, and it looked a lot like John Buscema's art. So much that I had to check the credits. He made a conscious choice to move towards is better known style. BTW, I tend to see a similarity between Sal Buscema's storytelling style on SSM and Mike Cavallaro's on SAVIOR 28. The quality that really jumps to mind is how both of them are able to express subtle (but dramatic) emotional shifts across otherwise similar panels. That's a really special skill for an artist to have, because done poorly, the reader would be left wondering why multiple panels are depicting the exact same action. But done right, it's an emotional gut punch! I agree, Jack, sometimes an artist's "personality" just doesn't click with a reader. I remember being very young and seeing Jack Kirby's art for the first time. I found it overwhelming, I couldn't process it. A little later, when I saw it again, that artistic personality made sense to me and I became a devotee for life. Re: the multiple panel technique. That's all there in the script )one of my favorite techniques). Of course it takes a skilled artist to pull it off and both Mike and Sal are VERY skilled. I think, at one point in its evolution, I may have asked Sal to draw SAVIOR 28, but he'd already given up pencilling. He DID agree to do a cover for us, though...and we got Joe Sinnott to ink it! Classic! 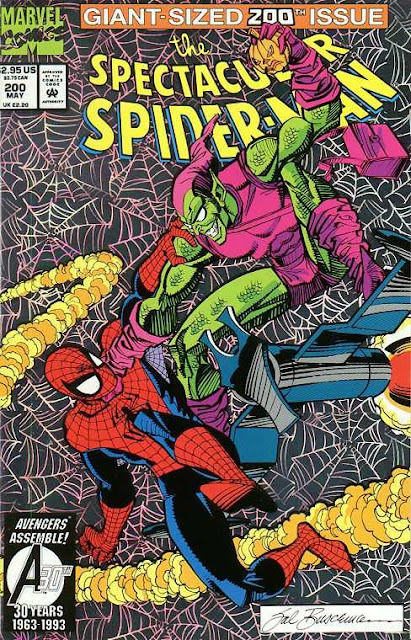 Those were some sweet alternate covers! I'd like to see our classic Beetle and Booster wander into the SA world. That would be fun! Booster and Beetle would be great! As for me, I think it'd be cool for the SCOOBY APOCALYPSE crew to unofficially crossover with...the original Mystery Gang in SCOOBY-DOO, WHERE ARE YOU? That would be pretty funny! well... The Ted and Booster from JL3000 are pretty similar to the main ones, and the future has crazy tech, and did we ever find out what happened to them? I just want some DC superhero to confuse Shaggy Apocalypse (now known as Shags-Apocs)with Oliver Queen. I know what happened to Beetle and Booster, but I don't know if anyone else will ever find out. Fair enough, but that means someone else DID find out. I started watching Supernatural about a year ago. I just started Season 6. It's fun. I am alternating between that and rewatching Twin Peaks before I get into the new stuff. But Scooby Doo and the gang from Supernatural using the old style animation? I may need to skip ahead to that episode when it comes out. That sounds great. I would like to see Scooby Apocalypse team up with a post apocalyptic Quick Draw McGraw. I LOVE Quick Draw McGraw! I don't know, I think I'll have to disagree with you, Dematteis. I don't think the popularity of villains in comics is random or SOLELY based off of talent. Much like Sci-Fi and horror fiction, it it about the fears of the time. I don't think it is a coincidence that mad scientists and foreign agents (both for Doctor Doom) were the villains of choice in the 50s and early 60s, when we were afraid a technological marvel would wipe life off the face of the earth. Nor that Thanos took root in the 70s and became more popular than Darkseid. The villain was the ultimate nihilist in a time when America struggled with its own meaning. Lets look at Spider-man in teh 80s. Doctor Octopus had moved from being a mad scientist to a gang leader, with only tinges of mad scienist. He was shown to be not only formidable, but vicious. Kraven moved into the realm of thriller acting i an atypical manner... at least compared to the plots of previous stories. Hobgoblin was created in that decade, and was the most omnipresent villain, his shadow over the main book in issues he wasn't in. And Hobby was way more similar to Kingpin than he was Norman Osborn. Spectacular Spider-Man was almost exclusively street level crime. Why/ Oh I don't know, the sky high crime rates that went from the death of kitty Genevies (not that that started it, but it is viewed as the symbolic one) to 1998? Side note, Batman's return to popularity and relevance was an upward trajectory from 1971-1999. I guess the real question is at a time when the only plots people can focus on and remember are about heroes going evil, fighting among st themselves, and invading sovereign nations... what does that say about our society now. The key to understanding our society is, like all things in life, in comics, science fiction and horror fiction. Sounds like a great idea for a book, Jack. If you write it, I'll buy it! Social ques have more to do than just the villains. The fact is that Marvel's current falling short of their hopes comes from a lack of ability to see social ques and read a room. Forget good or bad, there are plenty of good things that are overlooked, and bad things that become popular. This is only about how the time we are in and how it effects the was readers react. First you have to acknowledge the time we are in. As much as people want to say it is formed by our current president, or the now finished presidential election, we are in the same error that started in G.W. Bush's presidency. People forget what 1998-August 2001 were like from a social point of view. It was sterile and numb. The Matrix and American beauty are in many ways the same film (as well as very over rated ones) that became very popular and explored the same idea, why does a successful world not make me happy? Why does this feel off and fake and wrong? IS this really what life is supposed to be? 9/11 in a historical and human context was a tragedy. From a social standpoint it was a catalyst. Due to certain ideas from decades past, politics replaces religion, nationalism, and other aspects as the dominant ideology in people's minds. This is why Geoff Johns rose to prominence as the most important and beloved writer of the era, he threw true heroes into tough situations. And why Brubaker's Captain America and Geoff Johns JSA are considered the best. They talk of traditional values (a conservative point) and being more compassionate to enemies and accepting (a liberal one). Everyone could be appeased without being ham-fisted, and the dark elements reflected the struggle of the times. Then there is how the media and technology has segmented and alienated people. We crave as a species what we have lost, a connection to people. A deep connection. Mad Men was a decent series, but not an amazing one. People came in for the character work. FOr the sense of continuity. The simulation of a relationship. and that is hat most TV shows do and have done. It is also what the MCU did to become so popular. Also there is the fact that the removal of intangible concepts of great depth from society has pushed pop culture to a larger point in our lives to try and fill a void on our lives. Fortunately that is what comics due best, character work and continuity. Unfortunately marvel and Dc changed that, though DC has come around. marvel however has replaced many of their classic characters (which takes away that love of history) and stepped aside from character work for many of their characters, and any number of issues. It isn't about good or bad (though I do have thoughts on that) it is about just being out of step with what society wants and needs. Signed but the more surprising for me is that your run in Captain America is not yet collected. so much things to humanise the character, with the last time he had a real vast second cast,.. and so much of it being infused (Zemo, Sin, Vermin, Red Skull as a politician/bussiness man). Thanks, Fred! I would LOVE to see that Cap run collected in its entirety (and don't forget Paul Neary, who drew the second half of the run). They've collected bits here and there over the years, but it's way past time for the whole thing to get the tpb treatment. My guess is that Marvel's Epic collection will get to it. The first part is already collected. And that was among the numbered ones. Shouldn't be that long. Or it will. I don't know Marvel's schedule. Oh. That's one of the bits I was referring to. I'm not sure what Marvel's schedule is, either. They jump around quite a bit. It will take two more collections to cover CAPTAIN AMERICA #267-301. The last several Cap epic collections have covered Gruenwald's run, and they're about halfway through. Not sure if they'll complete that first or skip around. There doesn't seem to be any pattern I can figure out! But I've been keeping an eye out hoping it will pop up on amazon sooner than later. Now we just need to decide what to name them.